gravity invisible force that holds the solar systems and galaxies together. solar system The Sun (our star), Earth, our Moon, the other planets and other objects that are orbiting the sun. light year light year is the distance that light travels in one year, about 9.5 TRILLION kilometers. Distances between stars and galaxies. Galaxy a large group of stars, gas and dust held together by gravity. Our galaxy is called the Milky Way. a. spiral galaxy-has spiral arms, sort of like a pinwheel, the Milky Way is a spiral galaxy. 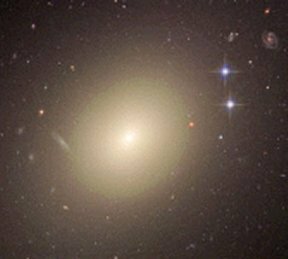 b. elliptical galaxy-shaped like an egg, believed to be older than spiral galaxies. 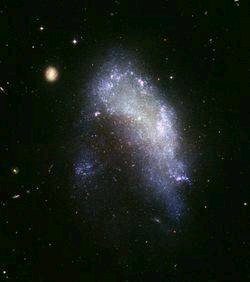 c. irregular galaxies-don't really have a shape. about 100,000 light years wide. 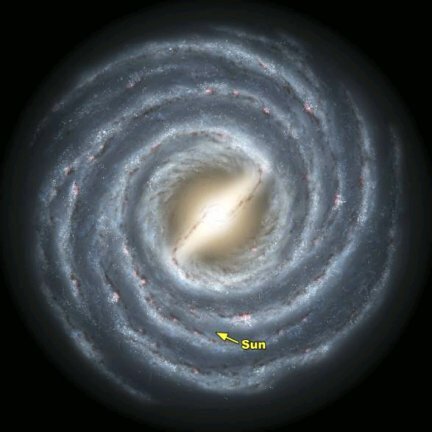 Our solar system is located in one of the spiral arms, we can't see the shape of the Milky Way because we are inside it.